AEC Daily’s self-paced read-along course. Hanley-Wood University's self-paced, read-along with audio course. 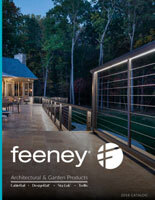 Our catalog includes information on CableRail Kits and Custom Solutions, DesignRail® aluminum railings and DesignRail® Kits, Trellis Collection cable and rod trellis kits, and Feeney architectural rods. Feeney's continuing education courses are hosted on various platforms. Click for more details.